I like flying from the water and the truly amphibious design of this plane really appealed to me. Had to have it. It's completely stock, although there are a lot of upgrades I would like to try, for now I'll just keep it the way it is. When I started flying FPV about a year ago my first testbed was my Parkzone T-28, which was also my lighted plane. Flying too close to trees I crashed several times and finally destroyed the T-28. I did replace it, but since my son is ready to start flight training I did not put a bunch of lights back on it. When the Pawnee Brave came out, I thought it looked cool, plus I needed a night plane, so I ordered it up. I'm very happy with it. Pretty much stock, just added a receiver controlled switch for the lights and a few red lights on the belly to help with orientation. A buddy of mine bought this kit years ago and it has sat unassembled in another buddy's shop for a long, long time. I asked my buddy if he would sell it to me, and he did. I tried to run a 500 size helicopter motor in it, but I just burned up the motor and ESC. So now I'm basically running a stock EF-1 setup. I have not had it on radar yet, but it appears to be between 120mph and 130mph. With one huge advantage, it flies like it is on rails. 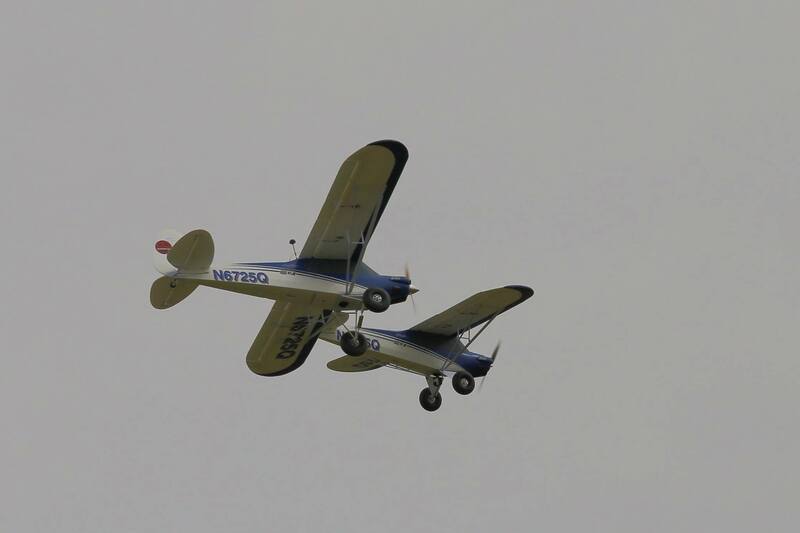 Really nice flying plane. Since I've got the Rare Bear going almost 170mph, this plane seems kinda slow. So I decided to sell it off. After posting it on a local for sale group, my buddy who originally owned it bought it back from me. I got this second hand from another club member. I've always been fascinated by contra-rotating props. He did a real nice job setting this plane up, although it is a little under-powered. Still fun to fly around. I have wanted a fast plane for a long time. But what to get? Flying wing? EFX Racer? Pylon racer? Hotliner? I *know* I'm going to crash it, because it's going to be going very fast, very low to the ground. I really don't want to put the money into it that a pylon racer or hotliner would require. When E-Flite announced the Rare Bear at 100mph stock, I wasn't all that impressed. I have sport planes that will do 90mph. I was looking for 130mph+. I wasn't going to get a Rare Bear. Then a buddy of mine got one. Seemed pretty nice. Then another buddy talked him into flying it on 6s! It was fast. I posted a little in the Rare Bear thread, and Seth Arnold responded that the plane was good to go on 5s, and recommended a few mods on 6s. At that point I was fairly hooked. My Rare Bear is 3.25lbs ready to fly. And the stock motor, with 100a ESC and APC 8x8e prop is around 2100 watts. My current speed record is 169.8mph. Ethan with the Rare Bear. Impact with an insect at 100+ mph. This is the remains of my first Rare Bear. Note the grass embedded 2-3 INCHES into the leading edge of the wing! My buddy's first Rare Bear. Flutter, elevator clevis failed at 140mph ~5 feet off the ground. Current record. Flat pass, 8-10mph tail wind. brand new 65c batteries. I've been flying for a little over 10 years now. I have never flown anything with internal combustion. In the last 5 years or so, I've developed somewhat of a reputation at the flying club by heckling the guys who do fly internal combustion. At the end of the day, I don't see anything wrong with it, but I do enjoy letting them know that I've never had a problem getting my plane started. So, when I saw this Durafly Das Uglystick with the fake glo motor on it, I knew I had to have it. I showed up at the flying field a couple times with it. The guys all had many words for me since I'm finally trying glo. I did ask them about my low compression, lol. After 3 or 4 days of flying it, it got really boring. So I sold it. I never weighed it, or put a watt meter on it. Blade Nano QX FPV, my entry into FPV. I've been interested in FPV for some time, but it seemed like a large financial investment just to try it out. Around Black Friday 2013 I had bought myself a cheap TV to use, but it never got further than that. February 2015 I went over to a buddy's house and tested out his Nano QX FPV on both Dominator V2s, and also my TV. I decided I liked the TV better, and that I loved FPV. Went home to order my own Nano QX FPV, only to find they were on back order until April. Nano QX FPV #1 started life as a regular Nano QX. I bought the clear frame, front props, and camera mount from Horizon. I got the camera here on RCG, it apparently came off of an FPV Vapor. So the one below with no canopy and black rear props was built up by me back in February. Nano QX FPV #2 arrived from Horizon last week. I had back ordered it in February. It's only flown a couple times so far, just to test it out. My initial setup is an ImmersionRC 5.8Ghz Uno receiver with RHCP Omni going into my TV. Now that I've gotten into it, I think I'm going to be spending a lot more money on equipment, but this is working pretty good so far. FPV at the local R/C Race Track on a rainy Saturday. This came up at a local R/C swapmeet for $30. I thought it would be super cool to get it flying. It did fly twice, but it was a handful. It's also pretty impossible to land on a grass field without flipping over. I decided to sell it while it still looked like an airplane. I wish I had gotten some in-flight photos, but I didn't. After I had some fun with the KK2.0 Quads I built I decided to grab a Naza-M lite and build something new. This was actually back on Black Friday 2013, I just hadn't gotten around to posting my blog on it. That's because I had a heck of a time getting it to fly right. I started with some Multistar 4220-880Kv motors and after a few test hovers, I was flying about 50' up and the thing just randomly shut off. The resulting crash destroyed almost everything, frame, gimbal, landing gear, an ESC, etc. I bought everything I needed to repair and then started with very low level test hops. What I found was that violent stick inputs would make it shut off. And sometimes it would just shut off on its own. I tried upgrading ESC firmware, Naza firmware, adjusting gains, changing props, and everything else I could think of. Still crashed. Finally I found a thread talking about the SimonK firmware and Afro ESCs sometimes not working well with high pole count motors. Well these Multistar motors are 12 pole. That's higher than normal. As a last ditch effort to get it flying I bought some NTM propdrive 28-30s 900Kv motors which are only 6 pole motors. The quad was now reliable in flight. However, I was still extremely frustrated with it. And quite a few others in the club now have nice LOS camera carrying quads which have proven to be somewhat boring. I never spent the time to mount my replacement gimbal and the quad sat in the hangar for quite a while. Recently it has been disassembled in order to use the components on an FPV TBS Discovery. I've been flying R/C since 2005 and this is my first P-51 Mustang. It's also only the second P-51 I've ever flown. Absolute sweetheart of an airplane and a heck of a value too. Other than changing the power connector it is 100% box stock. Horizon had a sale. How can you pass up a 600 size helicopter for $450? With all the things I added it's still under $800. It's a nice machine, probably not state-of-the-art, but it flies just fine. After I crashed my Frankeheli/Trex 450 SE 3s helicopter I wanted to get another 3s 450 size machine. I like having the lower head-speed/longer flight time of the 3s machine. I already have an Align 450Pro DFC stretched running 6s and also a 450L Dominator running 6s. So, I took the servos, ESC, BEC, motor, and FBL that was installed in the 450 SE and installed it in an upgraded Tarot heli. For the Tarot I pretty much bought all of the upgrades that you can get. The only Tarot parts that I had any problems with were the main gears, which had some wobble, and the canopy which was crushed a little in the package. Otherwise the Tarot stuff has been just as good, if not better, than Align. After crashing my Blade 500x in September of 2013 I had wanted to get a T-rex 500Pro DFC to replace it. Unfortunately things kept getting in the way. In June of 2014 I finally got it. Out of the box it is nearly as nice as the 500x with tons of upgrades was. To me, it really feels about the same as my upgraded 500x. I liked my Carbon-Z Cub so much that I decided to get the smaller one. I went to a 30a ESC and a bigger prop right away. I also added a water rudder from the Carbon-Z cub to the back of the Hobby Zone floats. RX and ESC have been dunked in Corrosion X and now I have another small land/water plane. I will most likely add Morgan Mill skis this winter. Static test: 215 watts with the wood prop. Static test: 200 watts with the T-28 prop. Primarily wanted this plane as a nice foam float-plane. But it flies so nice, I find myself taking it out frequently. I really think Horizon hit a home run with this one. ESC and RX have been treated with Corrosion-X. My first CZC fell backwards out of a hover about 10' up and I was not able to recover. After a hard nose-first crash I was able to repair it so it looked pretty good, and flew good as new. I sold my first CZC to a good friend at the flying field to use as a trainer for him. My second CZC is the one that I'm flying today. I did end up with the plane upside down in the water with the throttle on a little and it killed the stock E-flite ESC, so I installed an Align 70a I wasn't using. I also have a third CZC which is new-in-box. I figured as much fun as I'm having with this plane, I'd like to make sure I have all necessary spares. 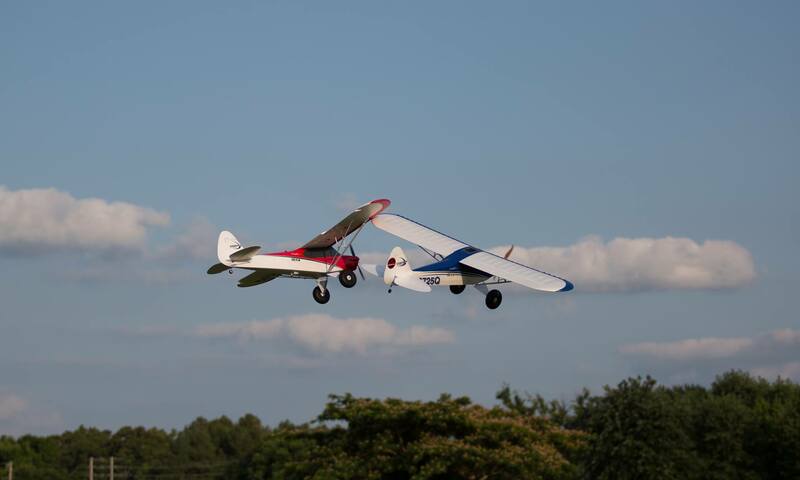 This plane, and my E-Flite Taylorcraft 450 are the only two planes that I've ever bought three of. So that should say something. EDIT: Sure enough, after two months my magnets came loose in my motor. Started sounded like I was grinding rocks in my cowl. I got a Turnigy G60 500Kv to replace it. We'll see how it does. EDIT: I've been dabbling in FPV lately. Since the CZC already had the camera mount on it, I did throw the VTX on it and chase another CZC around the field with it. My son showing off my CZC. Love to taxi with the tail off the ground. I put the Magpul stickers on to make it look different than the FIVE other CZC at the club. I popped the left counter balance off doing a low knife-edge. I glued it back on. My AS3X equipped Cub family. Even though I already own the 450L Dominator, a deal came up from another club member that was just too good to pass up. So now I have a stretched 6s 450Pro DFC as well as the 450L. They're actually pretty different in the air even though the only significant difference is the motor. The 450L runs like a scalded ape, it's an absolute rocket even with the governor running at 75%. The 450L also is limited to only 3m30s of flight time. The 450Pro is still plenty powerful, but it's not quite the rocket ship that the Dominator is. I'm also able to fly the 450Pro for 4m30s without any trouble. When I got it, it had a bunch of orange and yellow on it including a re-painted canopy. It also had a Tarot stretch kit on it and some pretty beat up Tarot 345mm blades. I swapped out the Tarot stuff for 450L parts and replaced the canopy and main blades. I also replaced the main and tail bearings and the swash plate. I thought this looked like a pretty neat helicopter. I'd been thinking about a 450Pro DFC but when this came out, that is exactly what I wanted. Turns out, it's a monster. Really scared me the first couple times I flew it because of how fast it was. It's much faster than even my Blade 500x. After a week or so I got used to it. Now I love it, except for the flight times. I ditched the 3GX and used a BeastX instead. I also had some problems with tail wag at extremely high speed. To fix it I kinda threw everything at the problem all at once. Cost a few bucks, but there's no wag now. One of the first few flights. I started messing around with quads in the fall of 2012. The first couple I built used the KK2.0 flight computer and a pile of HK parts. The very first one I built was for my buddy Michael on the Talon 2.0 frame. Later that quad was rebuilt using a 550 frame that could accommodate tall landing gear and a gimbal below. Michael has since moved up to a TBS Discovery Pro while I built myself a Naza-M Lite based quad. I keep my 550 around, stripped of gimbal and camera, to fly basic aerobatics with and use as a trainer for people. Here is a video that Michael shot with his KK2.0 quad that I built. It's the one below with the green LEDs on it. I built this one for my friend Michael. But one of the prop adapters broke and it crashed. I rebuilt the Talon V2 with this frame for Michael. I'm really happy with this one right now. Swapped the 10x4.5 plastic props for some 12x4.5 carbon fiber props. My quad now flies great on 3s2200s for about 6 minutes. Gimbal is next on the list. In 2013 I hit the helicopters hard after 5 years of flying only airplanes. The initial purchase was four Blade BNF helis, and I liked those so much I decided to add the 300x to the fleet. It has been extensively modified so far, it flew good stock, but I like to mess with things. Brand new, swapped tail servo, blades, and added the Lynx frame stiffener. The latest version. New blades, new tail rotor. Electric Flight, Shooting, 4x4, Cycling, Hiking, Car Audio.